A kitchen is often the most ornate room in a new house – but by definition, it must also be the most functional. Designing an optimal kitchen means taking inventory of your family’s lifestyle and knowing what you need in terms of storage, standing room, and workspace. 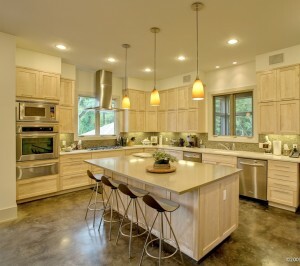 Keep in mind that a kitchen is meant to be used, not just admired. Here are some key initial considerations. An important concept used by architects when drawing up plans is the kitchen work triangle. Food preparation in the modern home (and the resulting clean-up) is a dynamic that involves three key places in the kitchen: the stove, the refrigerator, and the sink. For an efficient work flow, these three venues should be disparate enough from each other to form a distinct triangle – but not so far away that you can’t easily walk from one to the other. According to the University of Illinois School of Architecture, no “leg” of the triangle should be less than four feet or more than nine feet. Nothing should obstruct the lines of the triangle, including island countertops, appliances, or pulled-out cabinet drawers. If the kitchen is a thoroughfare between two other rooms, it’s important that the triangle not intersect with this line of traffic. To account for an occasional crowded kitchen (and the fact that modern families typically have more than one person working in the kitchen at the same time), each leg of the triangle should give the occupant about three feet of walk space. Obviously, in many houses, the size or shape of the kitchen may make it impossible to have a layout which forms a classic triangle. In this case, it’s useful to at least have a layout that puts the stove between the sink and refrigerator – otherwise, the walk time from refrigerator to stove will burden your food preparation process. You can place other important appliances and amenities into the triangle model based on their relation to the big three elements. For example, most food being microwaved comes straight from the refrigerator, so it might be optimal to place the microwave beside the refrigerator. The overall look of your kitchen will be determined primarily by your decisions on two materials: cabinetry and countertops. Cabinetry is the single most expensive line item when remodeling or building a kitchen, typically accounting for about one-fourth of total cost. The first step to making economic decisions about cabinetry is to determine how much storage space you will truly need. It helps to take a current inventory of your kitchen, noting how it currently works and how you want it to work. Efficiency is important in the kitchen, so determine how much space you need for perishable and non-perishable foods. Decide which cooking devices you need constant, quick access to and which can be placed in long-term storage. 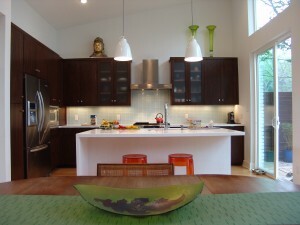 With all of our projects we use custom cabinetry. Custom cabinetry eliminates the needs for fillers and gives you unlimited options for function, versatility and design. Keep in mind that cabinets are not the only means of storing cookware. Open shelving is becoming increasingly popular as a way to lend modernity to a design, make optimal use of space, and help the kitchen appear larger. While cabinetry is the most important element in terms of cost, countertops may be the most important in terms of aesthetic feel. The most commonly used materials for kitchen surfaces are granite, marble and quartz. Granite and marble are often used for a more natural look, while quartz offers more options for customization. Though it can be slightly more expensive than some granite, quartz offers the added benefit of being completely stain-resistant and maintenance free. Quartz is also heat resistant up to 400 degrees. 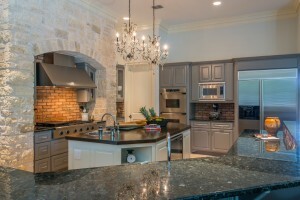 Soledad specializes in whole-home remodeling. We know how to keep a remodeling project from re-arranging your life completely. Even if you don’t yet have a plan or an architect, call us today to start the process of re-imagining your home, from the big picture down to the last important detail.